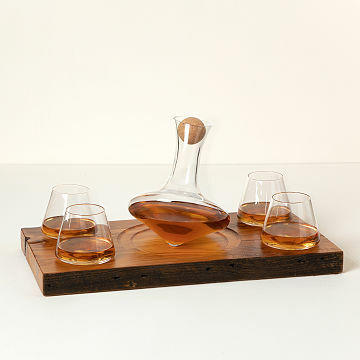 Local artisans collaborate to create this aerating glassware and reclaimed barn wood stand. Wine and conversation always sets the room spinning, but this handcrafted spirits set spins a tale of its own. A home-grown effort all around, the reclaimed wood stand and glassware hail from designer Patrick Fitzpatrick's native Illinois. The glassware is hand-blown in Chicago and the Czech Republic by a friend of the family. Using the same meticulous process, the makers spend hours annealing and shaping the molten glass into the unique forms that are then torch-cut and fire-polished to a glossy finish. The decanter and glasses twirl after you set them down, aerating your wine, hard liquor, or cordials while putting on a show. The rustic stand is made from salvaged barn wood sourced from a farmer who lives in Central Illinois. Up to 100 years old, the old-growth wood is beautifully aged by the seasons of the Midwestern Plains. Reclaimed wood base handmade in Chicago. Glassware hand-blown in Chicago and the Czech Republic. Patrick Fitzpatrick's designs highlight his eclectic academic background. His pieces mix skills he developed studying sculpture at the University of Illinois with digital output methods from design grad school at The Art Institute of Chicago. As a result, he's able to turn the artistic and hand-rendered into what he calls "a salt-of-the-earth production." While each item created is designed for function, it remains artistic in form. He also works hard to stay true to his roots: His company sources reclaimed barn wood from the small town from which his father was raised and he employees local artisans to help his artistic vision come alive. Hand wash glasses and decanter. Wipe base with a clean cloth. Spinning Spirits Set: approx. 17.5" L x 9.25" W x 1.5" H; 5.5 lbs. Although I have not seen it personally, it was an engagement gift for our niece, I had placed the order on July 23 and had been told it would not be delivered until Aug. 20-25. Originally, a bit disappointed as her engagement party was Aug. 11 and I had wanted her to receive it by then, however, I was pleasantly surprised that it was delivered to her on August 2 and I received a thank you from her that she was absolutely thrilled with it. Every day use and entertaining. The carafe is the only difficult part to clean. The design is absolutely lovely. I would give and get this all day long. It is a beautiful display piece, but also very easy to use. The wooden base is beautiful, and the glasses appear to be of very good quality. Just the right wedding day gift for a husband that doesn't need a watch or cuff links!